I cannot be 100% sure, but I think I may have found the first occasion in which Falkirk FC took part in a sporting occasion outside of football. 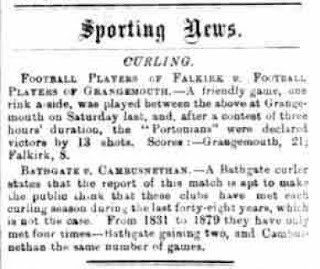 The following cutting was in the Falkirk Herald of Thur 6th February 1879, and relates to a curling match in Grangemouth. The difficulty in asserting this is pretty obvious though: for a start "Footballers of Falkirk" is not the same thing as Falkirk Football Club. On the other hand there is no record of other football going on in Falkirk at the time. There is also the fact that there was a Grangemouth Football Club at this time [however they played their football with the oval ball], and that there was contact between the two clubs is beyond doubt, due to the fact that the Peddie brothers played for both clubs. So all in all I think that it is most likely that the two local clubs, in the middle of the season, instead of playing a match at one or other code of football, had a friendly competition in a completely different sport.